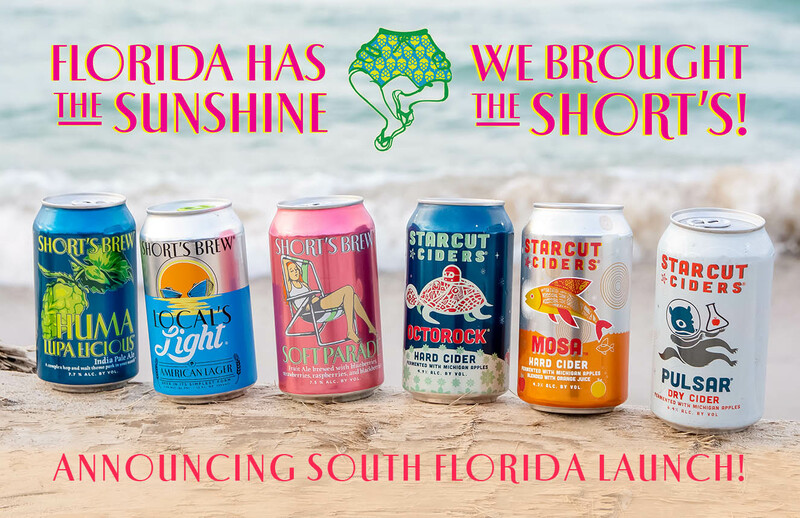 Short’s Brewing Company is excited to announce that after a successful central Florida launch, they will be expanding distribution to southern Florida with Cavalier Distributing. The expansion will be celebrated with a series of events April 2-4, 2019. South Florida launch events will include tap features at Taquiza North Beach on April 2nd, The New Hotel on April 3rd, and Das Craft Beer & Pizza Singer Island on April 4th. Distributed brands will include Short’s flagships, Soft Parade, Local’s Light, Huma Lupa Licious, and Juicy Brut, Short’s seasonal Soft Parade Shandy, and Starcut Ciders’ Pulsar, Octorock, and Mosa.